The words training and development are mostly used together in the corporate world and are seen as activities focused on improving the knowledge, performance and productivity of the employees. However, there is a distinct difference between their meanings and implications, which are often overlooked by a majority of professionals. Training programs are organized by the organization to develop employees' knowledge and skills as per their job requirements. On the other side, development is not directly related to job requirement, rather it aims at the generic development of the individual employees for the long run. Think of this way- training is mostly provided to teach new skills while development focuses on improving existing skills. 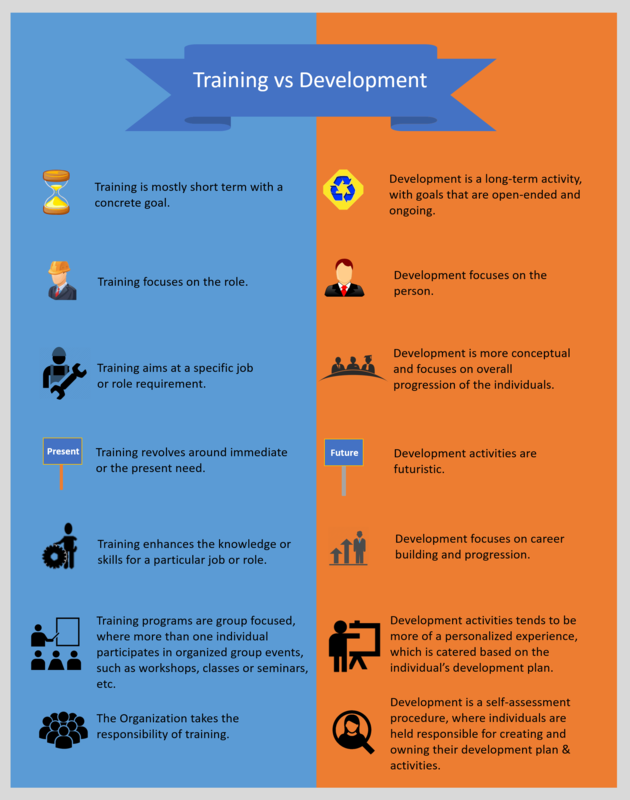 Let us look at the image below to understand the difference between training and development. With the ever-changing business environment, it is crucial that organizations pay equal attention to both training and development to stay ahead of the competition. Both training and development are required to work hand in hand for providing the right skills and knowledge to employees and help them get the most of it for both organizations benefit as well as their own progression. When an organization looks at employees' overall growth, apart from the job-related training, it also helps in building a more efficient, motivated and productive workforce.